This is the second part in a series of three articles describing how I created a basic DNS/DHCP/NTP server for my lab that only uses 24MB RAM and 12MB disk space. 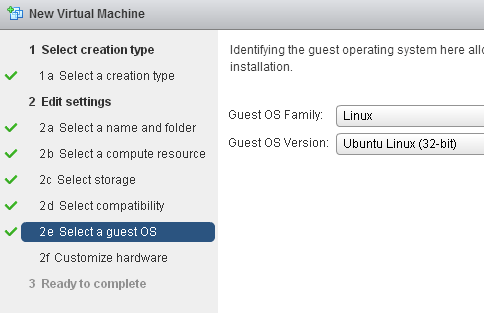 In your vSphere Web Client (or Windows Client) create a new VM. I based it on Ubuntu 32bit. 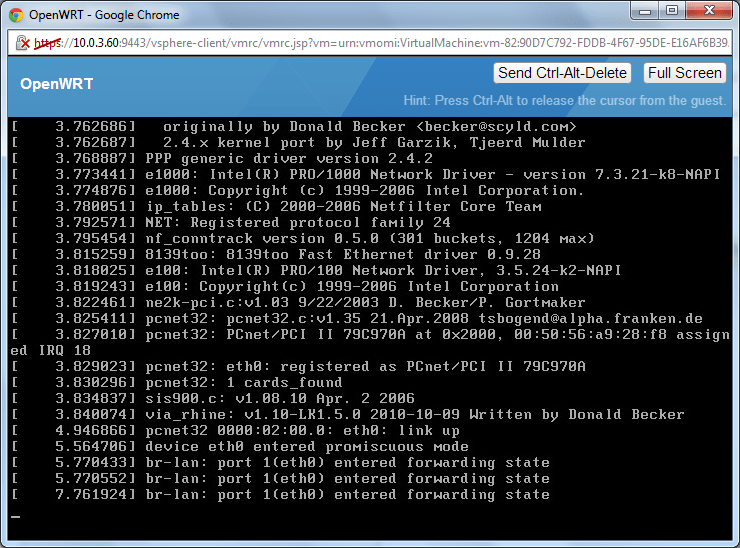 Before powering on the VM, upload the openwrt-x86-generic-combined-ext4.vmdk image to the VM’s datastore folder. 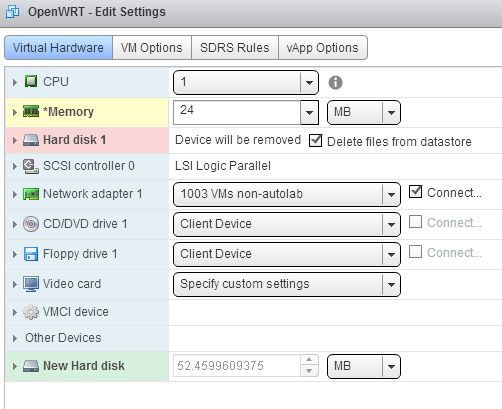 Then edit the VM’s settings to reduce the vRAM down (I run mine with 24MB, but you can probably go lower), make sure that only 1 vCPU is configured, delete the VMDK that was originally attached during the creation process, and attach the OpenWRT disk. Now that the install is complete, onto the configuration. Please note: I’m only going to discuss the configuration of the VM and the host it sits on. How your hosts are connected to their switch, how the switch is configured and what it’s capable of (layer 3 switching?) is up to you. Ordinarily, at least couple of interfaces are created (not including the loopback interface): lan and wan and they’re bridged together. But because we built a standard VM which only has a single vNIC, then only the lan interface is created. This is exactly what we want because we’re not planning on using this appliance for routing or firewalling traffic (although you could if you wanted to). By default the lan interface is set to 192.169.1.1/24 so if the VM is on a subnet that you can connect to via this IP, then you should be able to connect with a web browser and configure everything in the GUI. However, I want to set up DHCP for several trunked subnets and I’ve found it much quicker just to enter this straight into the config file from the outset. Here’s how I set it up. I changed the lan (eth0) interface to remove the bridging and set the IP address appropriately. I also added two virtual trunked interfaces (mgt and vms). The syntax to do this is eth0.x where x is the VLAN ID. 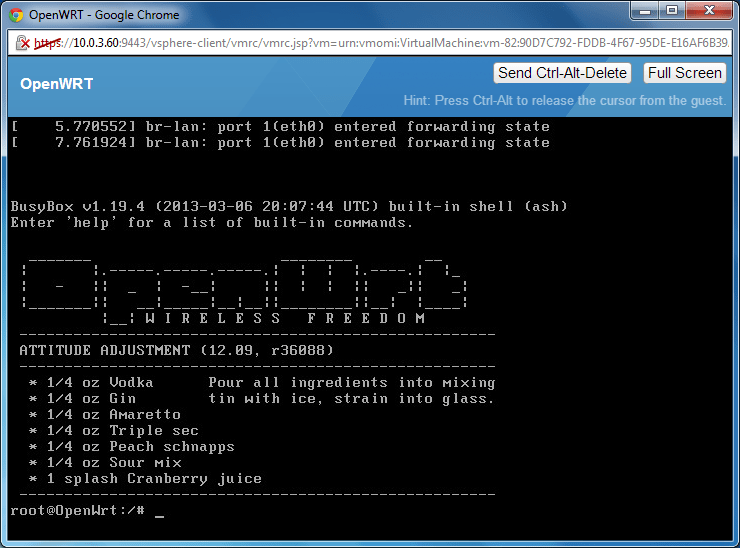 For each virtual interface give it a name and an appropriate IP settings for that VLAN’s subnet. My lan interface doesn’t need VLAN tagged as it sits on the switch port’s default VLAN (PVID). Top tip: in vi you can use yy to copy (yank) a line, and p to paste it. to stop and restart the network interfaces. Now, if everything is set correctly you should be able to ping each interface from something in each subnet (or from anywhere if you have layer 3 switching in your lab). 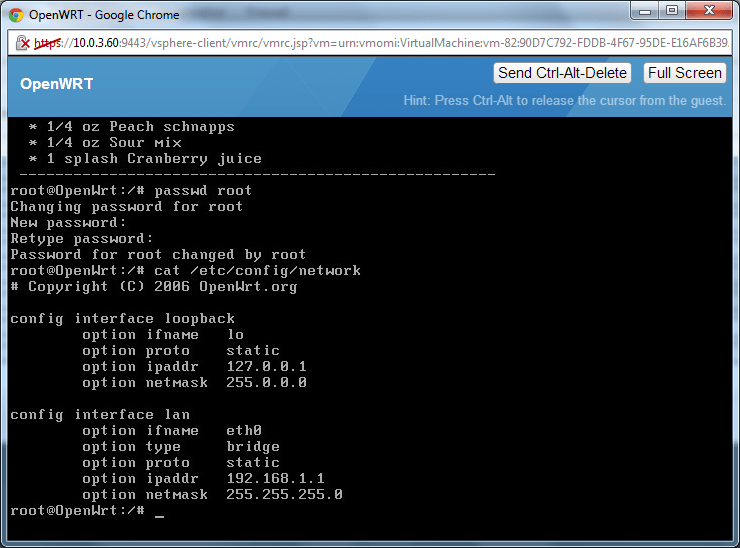 In the next post I describe how to configure NTP, DHCP and DNS services in OpenWRT.